William Dennison and his City Hall portrait, painted by Louis Kay. Photo by Tibor Kelley, the Globe and Mail, October 15, 1971. In 1966, long before Rob Ford vowed “respect for taxpayers,” William Dennison ran for mayor on a similar promise. And, like Ford, the veteran city councillor with a reputation for reflecting the views of the “common man” and always being available to listen to his constituents was not expected to win. None of the city’s three dailies endorsed Dennison. They believed he was a decent man, but one from the past who lacked the glitz of “go-go” incumbent Philip Givens or the conservative establishment connections of William Archer. “Mr. Dennison has never seemed to be associated with the dynamic thrust of modern Toronto,” the Globe and Mail observed in an October 1966 editorial. It is a little naïve of Mr. Dennison to suppose that the voters of Toronto will flock to the support of a man merely on the basis of this curiously negative claim that he knows how not to spend their money. Concern is such a passive word; it hints at fussing and fretting rather than action and positive thinking—and yet, in its way, it seems to capture Mr. Dennison’s financial philosophy better than any other word could. Dennison’s secret weapon was his rapport with the public, symbolized by a filing system peers envied. Anytime a constituent asked for help (say, with fixing a pothole), Dennison filed their name away. He followed up with greeting cards, condolence notices, or calls for help during election campaigns. “In politics,” he noted, “I have found that one must not write off an individual because you may not agree with him today, in two months, two years, or five years maybe he’ll support you.” He arrived at City Hall by 8 a.m. each morning, as he had noticed people with the most urgent problems showed up early after a fretful night. After he became mayor, his home phone number remained public and he set aside one day per week for anyone to visit his office. His genuine concern for the public, especially the working class, helped him build a loyal voter base that supported him from the late 1930s onward and led him to victory in every election he contested from 1953 onward. 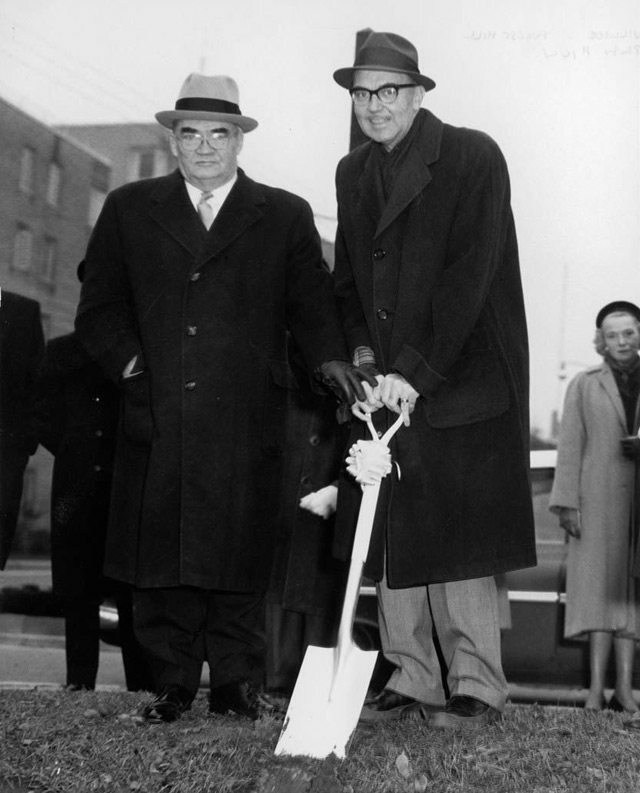 Frederick Gardiner and William Dennison at sod turning ceremony for Forest Hill Village municipal offices and library building, Eglinton Avenue West at Vesta Drive, November 13, 1960. Photo by Geoffrey Frazer. City of Toronto Archives, Fonds 207, Series 1251, Item 149. Dennison’s early personal struggles and his ability to draw from his life anecdotes that voters could relate to aided his career. Born in Renfrew County in 1905, he was afflicted with an intense stutter. But when engaged in political activities, Dennison was able to control his speech impediment—during the 1919 provincial election, he was such an effective heckler for the United Farmers of Ontario that rival parties stopped sending candidates to his area. Through training, Dennison overcame his stutter and opened a speech therapy school, which he ran until he became mayor. His early socialist leanings led to a long affiliation with the Co-operative Commonwealth Federation and its successor, the New Democratic Party. Like many socialists in the 1930s, he made street-corner speeches in working-class neighbourhoods. This didn’t impress the police, who in 1938 charged him with disturbing the peace for speaking at Queen Street East and Seaton Street. The charge was quickly dropped when it was proven the only people disturbed were the cops. Within a week, Dennison was back at the corner, thumbing his nose at the arresting officer. 1938 also saw Dennison’s first successful run for office as a school trustee. Over the next 30 years he served on both levels of city council as an alderman and controller, and served two terms as an MPP for the electoral district of St. David. His political leanings resulted in accusations of being a communist, which resulted in a successful libel suit that saw Dennison walk away with one dollar in damages. He played up his interests in farming and beekeeping in order to cultivate the image of a hick in the city, which proved a successful campaign tactic. 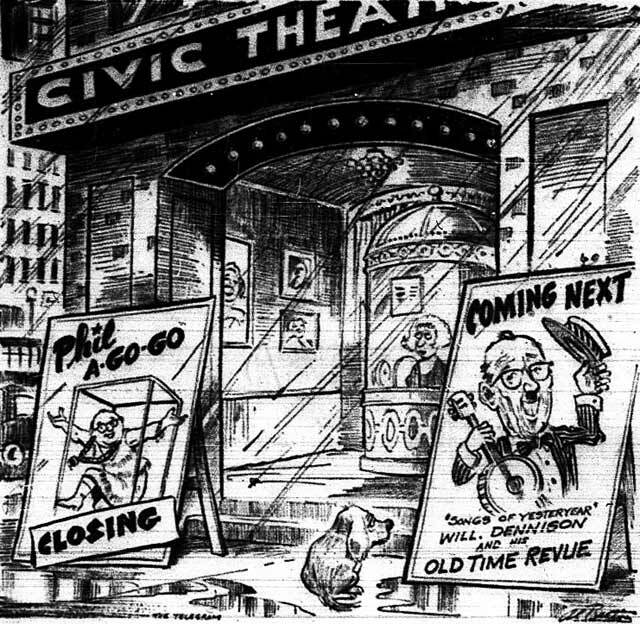 Cartoon by Al Beaton, the Telegram, December 6, 1966. In the 1964 election, he received the highest vote total among Board of Control candidates, resulting in his appointment as council budget chief. He tended to be a penny-pincher who, mindful of his constituency, insisted on using a beat-up, rusted Cadillac Fleetwood as his official City vehicle. He ran into several controversies to do with public art, especially Henry Moore’s Three Way Piece No 2, aka The Archer. When the Board of Control approved purchasing it for over $120,000 in March 1966, Dennison was the lone dissenter. “I don’t swoon with ecstasy when I look at pieces like this,” he said. “It’s the job of the art committee to recommend something that is at least acceptable. I feel the people of Toronto don’t appreciate this type of sculpture.” City council as a whole rejected the purchase, forcing mayor Givens to raise funds privately. Dennison used The Archer as a campaign point in 1966, promising he would avoid such follies in the future. Despite his fight against the sculpture, however, Dennison’s victory speeches indicated it would stay in Nathan Phillips Square. He also vowed to sell Old City Hall for top dollar (after fighting for its preservation as a councillor), support construction of the controversial St. Lawrence Centre for the Arts, hold the line on taxes, and urge the province to assume the City’s educational costs. 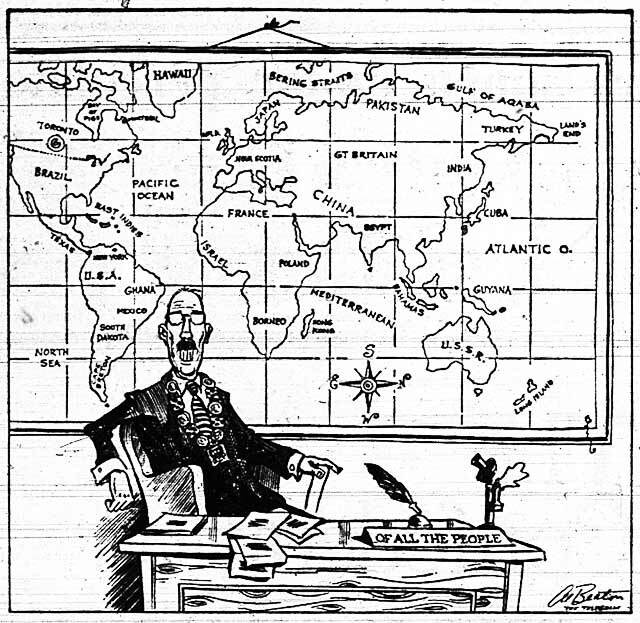 Cartoon by Al Beaton, the Telegram, July 15, 1967. Dennison crusaded for the amalgamation of the municipalities within Metro Toronto. He dismissed suburban politicians as being afraid of losing “their little empires.” After an October 1968 speech in Buffalo during which he accused the suburbs of grabbing city assets like the CNE and Toronto Island, he faced censure at Metro Council. In April 1969 he prepared an 18-point brief on the need for a megacity which illustrated how the current governing structure of Metro led to unnecessary divisiveness and the duplication of services. Dennison felt suburban leaders were too chicken to put the idea to a vote, but Torontonians approved of it in a non-binding referendum on the issue that took place during the 1969 municipal election. Increasingly Dennison looked adrift, a man out of time who sided with the old guard conservative faction of council. He constantly fought with the reform wing elected in 1969. Bureaucrats and councillors across party and ideological lines sensed there was no concrete plan for the rapidly-changing city. The mayor also played upon fears of civil unrest, singling out leftists, hippies, and draft dodgers. The man once branded a Communist now applied that label to his opponents. He believed ratepayer groups were being infiltrated by angry academics and political misfits. Calls for height restrictions on developments led to accusations by activists that the city was being taken back “to the time when we would sit on a high stool and write with a quill pen.” Dennison rejected recommendations from staff and politicians in both Toronto and York to turn the Belt Line into a recreational trail, instead backing a land sale to local homeowners to extend their backyards (he claimed that “people have demonstrated they just won’t use it”). 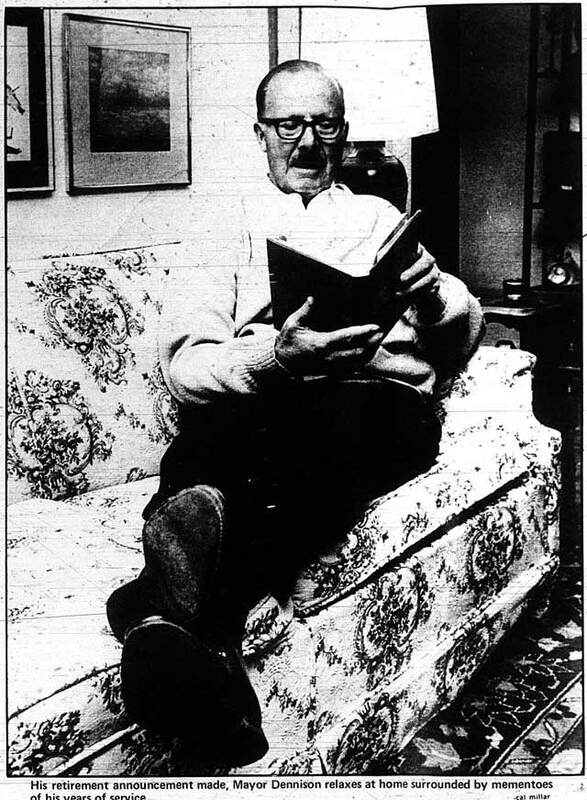 Photo by Cat Millar, the Toronto Sun, June 30, 1972. Although he once supported homeowners who were worried about plans for a southern extension of Highway 400, Dennison had less sympathy for the anti-Spadina Expressway movement. 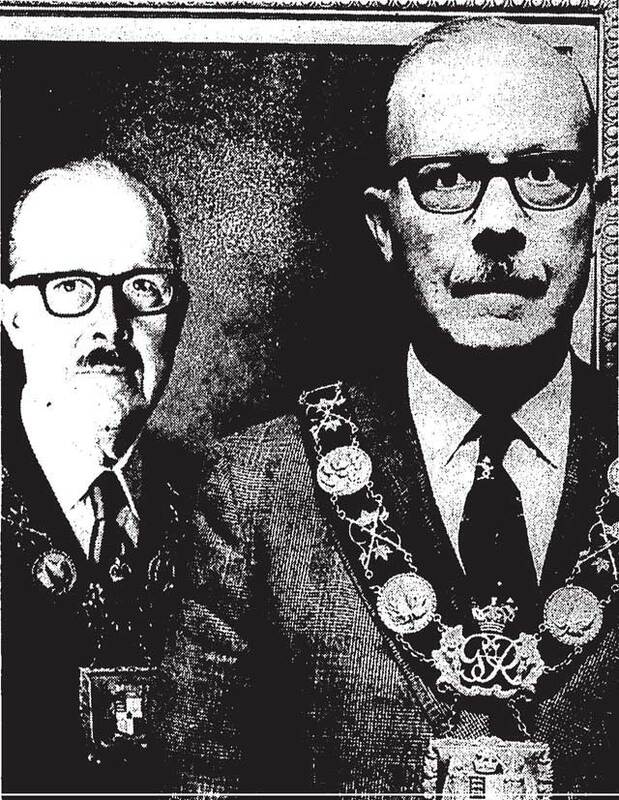 When he said opponents were “full of nonsense” on a lunch-hour radio show in May 1970, artist Guttorn Otto was so incensed that he demanded the return of his paintings from the mayor’s office wall. When Premier William Davis cancelled the expressway a year later, Dennison, then travelling in Italy, was astonished. “I think the provincial government has been a little hysterical in this decision,” he observed. “The opponents of the Spadina Expressway never came up with a good alternative. You can’t build a wall around Toronto to stop people from coming in. You have to build facilities to accommodate them. The whole thing is short-sighted and stupid.” Over the remainder of his term, he fought to revive the project, or at least complete the unfinished portion between Eglinton and Lawrence avenues. He’s a very decent, humble and straightforward guy. He’s been criticized from time to time for not being the sharpest person around, or the most charismatic. But he has taken what’s he got and made the most of it. Maybe he doesn’t deal in great issues all the time; maybe he doesn’t come across as a great leader, but when it comes to solving the problems of ordinary people, he’s always there. That’s the secret of his career. In this own way, he really cares about the city—and its people. Additional material from the February 15, 1966, September 27, 1966, October 19, 1966, July 17, 1967, September 7, 1967, January 2, 1970, April 22, 1970, October 5, 1971, January 10, 1972,and January 11, 1972 editions of the Globe and Mail; and the March 9, 1966, December 6, 1966, November 4, 1967, October 24, 1968, April 2, 1969, August 22, 1970, June 4, 1971, June 29, 1972, May 3, 1981, and May 5, 1981 editions of the Toronto Star.